Double Glazed Windows and Doors provides a one stop service for all your double glazing, window and door needs. And as part of the service as an added convenience we offer a great range of flyscreens as an extra for clients requiring an extra level of comfort in addition to double glazing. The flyscreens to match your double glazed windows and doors will protect from unwanted flies and mosquitoes. If you cant live without flyscreens as much as you cant live without double glazing we are ready to provide you with a cost efficient screen that is aesthetically appealing and functionally rewarding. Please note, however, flyscreens are not security doors and we always recommend using the key lock to lock all your windows and doors when closed for security. Retractable Window Screens provides the solution for insect, heat, and light control in an easy to install complete package. One sales trip to your customer is all you will need since CRL Retractable Window Screens allow you to measure, cut and install in one visit. Chose from 4 maximum opening widths in three beautiful colors and your ready to add a profitable addition to your screening services. Each kit includes easy-to-follow instructions, all powder coated extruded aluminum lineals, durable 18x16 fiberglass screen wire and quality mounting hardware. Screens are interior, inside jamb mounted and can be left in place all year eliminating the need for seasonal removal and installation. Four Adjustable Widths: 31", 39", 47" and 55"
NOTE Minimum cut down width is 23 inches (584 millimeter). We have researched the industry to find by far the finest retractable screen door system available. Versatility is the key to the CRL Retractable Screen Door System. 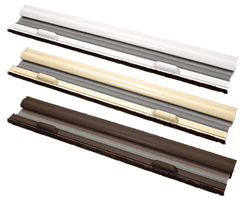 Choose from our 84 or 98 inch (2134 or 2489 millimeter) height models in four beautiful powder coated color options to fit any door opening up to 48 inches (1219 millimeters) wide. 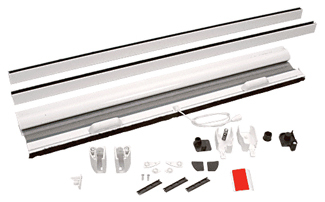 System will fit single swing, double swing, and sliding glass patio doors. Versatile screen casing can be adapted to window applications. Spring loaded casing retracts and hides the screen when not in use. Super flexible screen material is tear resistant. Screen casing, pull bar, guides, and strike are extruded aluminum. Nylon handles and hardware are provided. Screen system has full brush pile for extra protection from insects. Screen system can be cut to size and installed. Tree Powder Coated Colors to Choose From. NOTE Larger double door openings require two kits plus slide bolts. The CRL Door Rail for Euro Retractable Screen Doors is designed for a seamless bottom rail when installing two single door kits in a double door mounting method. Made from extruded aluminum. For Double Door Mounting Method. Fixed Screens used in open in windows, T&T, Casement, T&Slide.